Few days before Google Play Newsstand for iOS got redesigned, now Google has released a new version for Android with material design, larger headers and images, also the transitions are smoother. 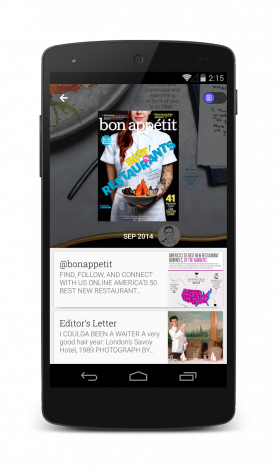 The Google Newsstand is an app by Google, which not only offers free content, but they can also offer their own content through the Google Producer, and even magazines on the web subscribe. The new version is currently being rolled out and should reach you soon.